Goal: To map relevant community spaces for a particular group in order to identify positive, negative or gender specific issues. Audience: Groups of 3-4 of a representative sample. Good with Teenagers 12 – 19 years. 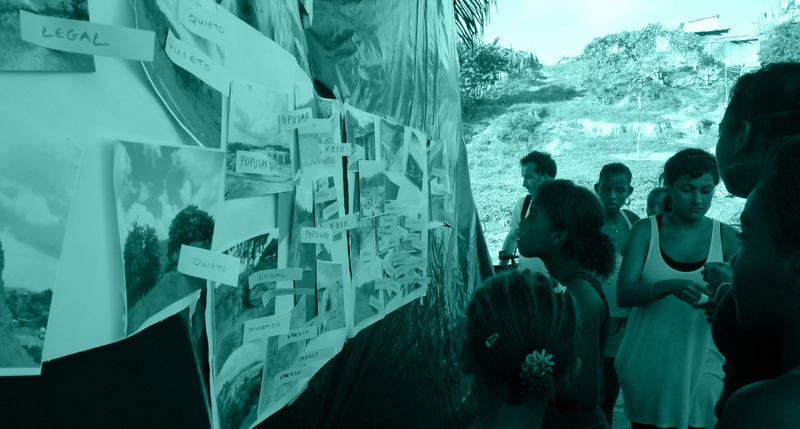 A mapping exercise where participants take pictures of their most and least favourite spaces in the community, discussing the characteristics of the space. The intention is to map the most relevant community spaces for participants with both positive and negative characteristics and identify potential stakeholder differences related to gender, age and culture. Firstly, participants take photographs and discussions are facilitated regarding what they like or dislike about an area or feature. This is done with small groups of 3-4 people. The second part of the exercise works with individuals and tries to define the qualities of the chosen areas, where pictures are printed and participants are asked to label each with a description. Participants also have the opportunity to label pictures with their own descriptions, providing more qualitative information regarding community spaces and a further platform for discussion and debate. Information is then mapped on an overall map of the neighbourhood to help draw relationships between locations. Step 1: Getting started. Organise the group splitting genders or age groups separately. The tool should be introduced stating what it is and what would you like to find out about their community. Each participant will be asked to choose one place that she/he likes the most and one she/he does not like, making special emphasis on thinking about the reasons that justify his/her choice: Is it a feeling? (fear, security, boredom etc), is it a physical characteristic? (clean, dark, lonely, far away etc.) or is it the activities taking place? (playing, drinking, fights, etc.). Step 2: Taking the Picture: Once the participants have discussed and selected the good and bad places, each participant should go to the selected locations and take the pictures. A facilitator should accompany the teenager when taking the picture in order to facilitate a one-to-one conversation and record the characteristics of the chosen places. Step 3. Preparing the tools. Print the pictures. Pictures should be numbered and labelled on the back with the name and age of the author. Arrange the pictures on the wall/floor or board, with only the numbers visible. Prepare a list of negative and positive characteristics commonly attached to spaces. As an example, refer to the list on the PDF, you can add or remove depending on the case. Once you have a list, make sure there is the same number of positive and negative characteristics. Write each of them separately on post-its ensure there is a copy of each characteristic for each participant. Step 4. Discussing the pictures. Now you can start the activity with each participant separately. Ask him/her to choose the photo that best represents each word. For example, ask him/her to choose which picture represents the most clean place. Continue to ask why they choose each picture to get more information and ensure they understood the meaning. Then, continue with each word until you use all of them, both positive and negative. Once the participant finishes, record the word pasted in each numbered picture or photograph the board. Now repeat the activity with the next participant. Remove the post-its each time before a new participant starts to avoid being influenced by the previous choices. Use a map of the neighborhood and identify graphically the places the participants photographed. Remember to draw SEPARATE maps for boys and girls to see the gender comparison. To assess the relevance of each place, count how many times it was mentioned and represent it on the map. To assess the quality of the space, start with allocating one symbol for positive characteristics and one for the negative, for example blue dots for positive and red for negative. Now go through your notes of each picture and mark on the map each time a word was used in a place. The resulting map will give you an idea of which places are perceived as negative/positive for girls and boys. – Discuss before taking the picture to make sure the participant understood the question and the task. – The exercise can also be done with drawings or sketches. In this case, the facilitator should go with the participant to the chosen place and sketch the image quickly. – Ideally the group of participants should be organised beforehand, however, be prepared to invest some effort into finding residents around the neighbourhood to participate in the activity. – Participants for stage 2 do not necessarily have to be the same from stage 1. You can discuss with other residents using the pictures previously taken by others. – Be careful with teenagers/participants influencing each other. If possible, implement each stage with participants individually. If small groups are necessary, try to identify participants that may influence others or those who are more shy to ensure they undertake the activity alone.